Purpose: To celebrate the (belated) end of the Infinity War and to have fun! 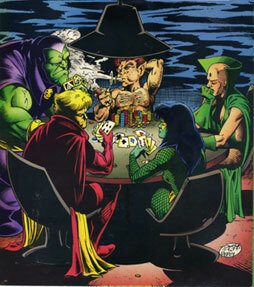 (Marvel Swimsuit Special#2) - Following the Infinity War, the Infinity Watch relaxed at their Monster Island headquarters with a card game. The team agreed to the stakes of winner gains the other members as "slaves for a day" and Pip the Troll won. Deciding to use his "slaves" to throw one giant celebratory party, Pip created a list of heroes and villains that should be at the party and the other Infinity Watch members reluctantly agreed to Pip's wishes. The following morning, all of the heroes and villains on Pip's list were transported to Monster Island via the Time and Space Infinity Gems. Preparing for a fight, the heroes and villains were coerced into a party mood by Moondragon's Mind Gem. 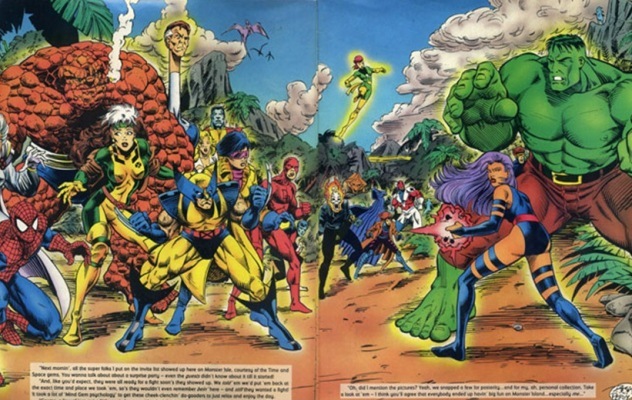 As the mind-manipulated heroes and villains celebrated, Pip snapped several photographs of the event for his personal collection including shots of Cloak & Dagger, Matt Murdock "eyeballing" Elektra, Scarlet Witch & Clea, Silver Sable posing by a sandcastle-disguised Sandman, Hellstorm & Gargoyle, Spider-Woman, Jean Grey, Sif & Thunderstrike on lifeguard duty, the New Warriors, Cable & Domino, Morbius, Mary Jane Watson & a shocked May Parker, Tigra, Gamora, Moondragon & Adam Warlock with a mind-manipulated Thanos, Polaris, Black Widow, She-Hulk, Psylocke, Ghost Rider, Northstar & Aurora, Excalibur, Phoenix, Hulk & Betty Banner, Wolverine & Jubilee, Persuasion, Colossus, Black Bolt & Medusa, Invisible Woman, Mr. Fantastic & Thing, Storm, Doc Samson, Punisher, a mind-manipulated Typhoid Mary, Quasar, Black Cat, Bishop and Val Cooper. Pip even had Earth-928 denizens, Spider-Man (Miguel O'Hara) and the holographic Lyla, transported to Earth-616 specifically for the party. Comments: Created by Dan Slott and a slew of artists (see below). Writers: Dan Slott, Stan Lee, Tom DeFalco, Mark Gruenwald, Bobbie Chase, John Romita, Sr., Virginia Romita, Gene Durante, Alison Gill, Melisa Danon, Evan Skolnick, Dawn Geiger, Steve Conte, Tom Brevoort, Bob Washington, Rick Mays, Jack Abel, Flo Steinberg, Robbie Carosella, Jesus Gonzalez, Scott Kolins, Kris Renkewitz, Bill Wylie, Terry Stewart, Michael Z. Hobson, Bob Riscica, Robert Losey, Kathy Beekman, Lou Bank and Jim Sokolowski.